"Code violation 300-6 Protection against Corrosion. 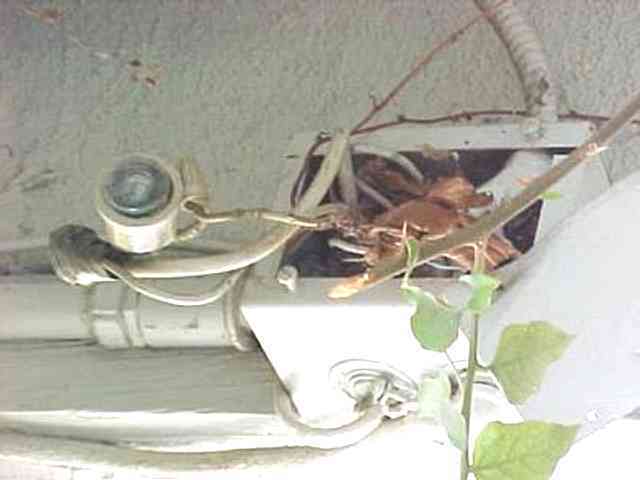 This junction box is installed outside on a commercial building where it is exposed to the weather conditions. Nonmetallic cable was used where it should not have been used. Lots of "elements" in this pic. Is that an Edison base fuseholder on the left? I can't make it out. Was this just hanging out like that, or was the box covered? Anyway, it's just awful. i like that new way of grounding the box through the plant. good thing it's a green plant to properly identify it.